La Masseria, the spawn of a New York City restaurant with the same name, stands out on scenic Route 1 in East Greenwich. The wonderful spring blossoms and warm weather enhanced the approach to this new restaurant. Its concept is simple; rustic Italian cuisine served in a dinning room that resembles a farm house. All food would be inspired mainly from the Puglia region, though bits of Capri and Naples worked their way into the menu. The concept fits well with Rhode Island's rustic past and strong Italian influence. Designer Libby Langdon designed the interior with very nice results, though a pretty restaurant does not often make a good restaurant. Me and my wife ate upstairs as part of a media luncheon that offered a lengthy tasting menu. The owners, Peppe and Enzo, introduced themselves. They detailed how their childhood in Capri influenced the restaurant. They introduced Chef Pino Coladonato and Manager Monopoli. They are the two in charge of the Rhode Island restaurant while the owners themselves would float between thee New York and Rhode Island locations. They made a special note that the staff had trained in the New York restaurant and transplanted to East Greenwich. Did the transplantation work? Our meal started with a two types of rustic bread with olive oil, grissini (house made thin bread sticks) and a glass of lemony prosecco. Manager Monopoli served as our sommelier for the meal, noting he would accompany every dish with an appropriate wine. The prosecco fit the day perfectly with a light taste. The grissini tasted a tad dry, but were very flavorful. We also enjoyed a classic white italian bread and a grainy wheat bread. Alongside side the bread came a small dish of olive oil sporting what looked like capers, though we were corrected that it was infused with lentils and garlic. The mixture went well with the hardy crust and tender miche of both breads. Our waiters then brought out the appetizer courses. The first course featured Bruschetta (small crostini topped with black truffles and fontina cheese), Fritto misto del Mare (a small selection of fried seafood), and I Cucuzielli Fritti alla Pino (fried zuchini strings). Overall, the presentation was nice but seemed a bit thrown together. The chef placed the fritto misto upon a slightly wilted red cabbage cup that took away some of the fritto misto's crispiness. The kitchen also placed a lemon-half alongside the trio. The lemon felt wildly out of place. The food, however, was delicious. Originally, we were told our bruschetta would have ripe tomatoes, mozzarella, and basil. The black truffle and fontina toppings surprised us (and it felt a bit like they were trying to buy us off), though it was delicious. The Fritto misto featured wonderfully sweet scallops and shrimp, though my calamari tasted a tad old and the texture was tougher than I am used to. The zuchini strings stole the show for me, despite being the least flashy of the trio. My wife preffered the truffle and fontina crostini, which was incredibly delicious. The delicate tempura crisped the strings perfectly, indicating why this was one of the owner's favorite dishes. We enjoyed the Bortoluzzi Pinot Grigio paired with the meal, noting it fit the summery selection. Our next appetizer course featured another house speciality, the Mozzarella farcita. This house-made cheese included a daily selection of ingredients stuffed within the delicate presentation. Our stuffing included marinated eggplant, roasted red peppers, and tender asparagus. A wonderful stainless steel-aged Puglia chardonnay paired wonderfully with this dish, and the trio of vegetables went wonderfully with the fresh cheese. Plating also improved with the stuffed cheese set upon a large coin of marinated eggplant. The final appetizer course, Terra mare del Tavoliere (grilled octopus and cuttlefish served atop broccoli rabe and a fava bean puree) paired with Feudi di San Gregorio Falanaghina. The wine was not stand-out with the dish, but the dish itself should grace every diner's table. The kitchen perfectly grilled the cephalopods tasted fantastic. Each were wonderfully marinated in separate concoctions that highlighted the unique tastes. I enjoyed the Octopus tentacles while my wife enjoyed the cuttlefish. Both proteins tasted wonderful dipped into the puree. The dinner courses started with the restaurant's signature Polpette di Manzo della Masseria (long Italian title for house-made meatballs). Chef Pino prepares a fresh bath daily ground from tender rib eye beef, resulting in a soft and tasty meatball. The delicate tomato sauce and fresh greens served alongside the meatball enhanced its flavor, which all went together with glass of Corvina-Rondinella wine made from Palazzo della Torre. The Palazzo della Torre was a table favorite, and it paired magnificently with the meatball. The Polpette di Manzo stands out as a simple dish that showed true proficiency and potential. A course of gnocchi followed the meatball. Gnocchi can be fickle. I've been to many restaurants with disappointing servings of the delicate potato dumplings. My wife also eagerly anticipated the meal given my gnocchi is her favorite dish. La Masseria's serving did not disappoint. The dumplings melted in the mouth with a wonderful pink tomato-basil sauce. My only complaint were the small beads of mozzarella, I prefer nice big pieces with the gnocchi, but it's a small gripe. The wine, a Vietti Dolcetta D'Alba, paired with this course. Next came another house speciality, the Penne Masseria. I was a bit disappointed with again having another tomato-basil sauce (present in the previous 2 dishes), though this one featured a nice smokey combination of pancetta and smoked mozzarella. The ingredients produced a very rich plate of pasta that was wonderfully seasoned. Manager Monopoli paired this dish with a lovely primitivo that he chilled in a Neapolitan style. It itself was a delicious summer wine, but I felt it did not pair with the richness of the dish. A nice Granotto al Frutti di Mare e Fagioli followed the pair of pasta dishes. Chef Pino prepared the grain like a risoto with a nice assortment of shrimp, clams, and calamari. Unfortunately, the problems with the calamari earlier (tough) continued to this dish. The shrimp and clams also tasted a bit overcooked, though the grains were al dente. The dish was supposed to also have white beans, though I only found one in my dish. A lovely Nero d'Avola enhanced an otherwise lackluster dish. Veal Milanese came out as the final entree course. Chef Pino coated the veal, tender-white and pounded thin, with crushed grissini. The coating worked producing a not-so-greasy milanese. A small salad of marinated tomatoes and greens accented the cutlet's seasoning. Manager Monopoli supplied a Barbera D'Asti to pair with the veal to compliment the protein. Together, the dish and wine produced a nice meal. After all this food, how could we eat dessert? When the waiters served coffee and two wonderful slices of cake we could not say no. First, we tried the Torta di Ricotta. This smooth ricotta cheese cake would embarrass any other competitors. The wonderful flavor mixed with a fantastic texture. My wife preferred the second slice; the Torta di Mamma Paola. The soft and flour-less chocolate almond cake stood up well to the more angelic cheese cake. Almond slivers added a nice texture to the cake. Together they surrounded a nice pile of whipped cream topped with a raspberry and delicious chocolate syrup. A digestif of Muscat'asti finished a lovely meal. Chef Pino proved the concept carried from New York to East Greenwich. The tasting menu represented the cuisine very well. I felt like I missed nothing and experience the Chef's goal. A few minor mis-steps did not destroy my experience, and my partner enjoyed her meal just as much. 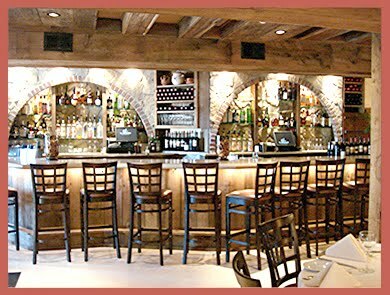 La Masseria has a full website for both locations.